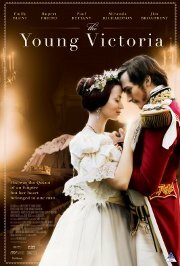 This movie takes a look at Queen Victoria's early life, mainly her first three years on the throne. When the reigning king unexpectedly died, she was thrust onto the throne at the tender age of 18, luckily before she could be convinced to appoint sneaky co-regents. While surviving assorted political intrigues, she found a mate in Prince Albert, who came from the same controlled environment that they both hated. Love blossomed between them, and the world was enthralled. I feel really silly in this hat.